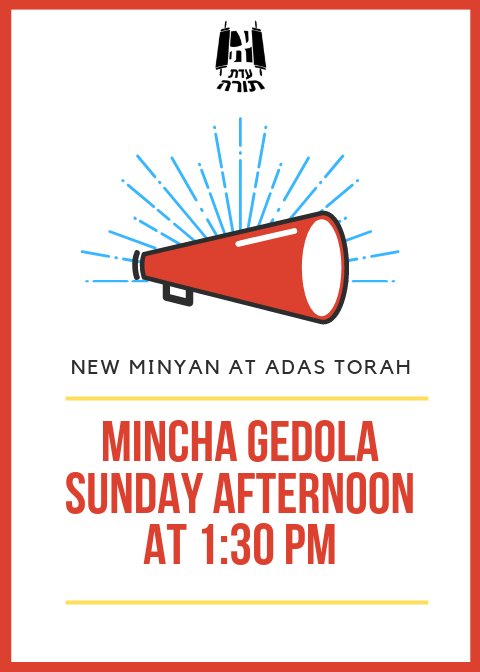 Adas Torah is a Shul centered on Tefilla, Limud Torah and Chesed. We have two minyanim on Shabbos and daily minyanim for all tefilos, and an array of shiurim and learning opportunities for men and women. Although our members are a diverse group, we are united as one shul and one community because we are all focused on the same three common goals: Primacy of Torah, inspirational and serious davening, and a strong sense of community. We welcome you to visit our kehila in the heart of the Pico Robertson community. The shul is excited to present the eleventh volume of its semi-annually published journal of Torah essays written about the Moadim, Parshios, and general interest topics by members of Adas Torah. Volume 6:2 includes thoughtful essays on Pesach, Sefira, Shavuos, Tisha B'av and general interest topics affecting our daily lives and Talmud Torah. The articles cover many aspects including Halacha, Machshava, Hashkafa, philosophy, history, and Chasidus. For dedication opportunities or to submit articles for the next volume of Nitzachon, please speak to Rabbi Revah, Michael Kleinman, or Yaakov Siegel. Please click here for dedication opportunities.